America has the grandest trees on earth - the largest, the oldest, and some of the most magnificent. Now, with Congressional passage and presidential signing of a historic bill, America has an official National Tree - the oak. Read the official press release. 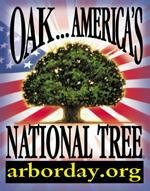 I'm happy to report that the people have selected the oak as their choice for America's National Tree in the nationwide vote hosted by The Arbor Day Foundation on this web site. From the first day of voting, oak was the popular choice of the American people. The Arbor Day Foundation wishes to thank everyone who voted or encouraged others to take part in this historic process, which marked the first time that the entire American public has been able to state their pick for a national emblem.